Wave count based on Elliot waves. At this moment, #BTC is descending through the bearish channel. It will confirm (b) once it breaks resistance of said channel. From there we start bullish momentum from (b) to (c) ending in B between $ 12,000 and $ 15,000. 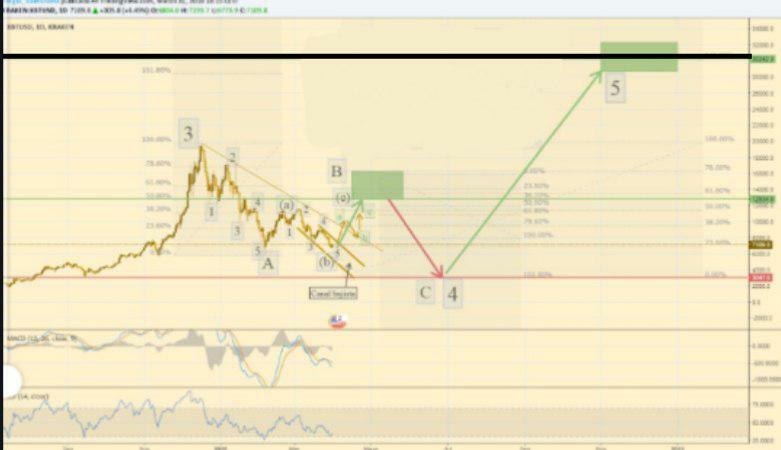 If my count is correct, once we reach B, we will go down again towards the 3000 $ in C, where we would close the main wave 4. From here we start the last impulse wave until we reach $ 30,000. Bullish outside/engulfing candle and oversold RSI indicate sell-off has stalled for now. Acceptance below $6,600 could yield another leg lower towards $6K. Malaysian low-cost airline AirAsia is launching a cryptocurrency-based rewards program. AirAsia chief executive Tony Fernandes told that its frequent-flyer rewards program is being converted into a cryptocurrency platform called BigCoin. The move is part of a broader effort to improve the airline’s digital services and move the company toward a cashless system. Fernandes described a system in which customers could buy seats, in-flight meals, seat upgrades and other services using BigCoin, in addition to existing fiat currency options. Previous PostPrevious Why BTC is falling? Is this the end of crypto?